I love my new Saky Sack! Its the perfect summer accessory and great when you are on the go. Nowadays stores are making you pay for plastic bags as a way for us to help the environment. I don’t like having to shell out any extra $ so I make that little effort to keep my own bags with me. Plus, you never know when you are going to need a bag. My bag has come in handy on my trips to the post office to pick up my parcels. I like to be prepared! Saky Sacks are basically stylish reusable bags that can be used anywhere! They are great to take with you on your trips to the grocery store, pack your towels and sunscreen for trips to the beach or to use as an overnight bag on trips out of town. They are both lightweight and strong as well as tear, stain and water resistant. The material is Tyvek Â which is known for being very durable. The Saky Sack holds up to 25 lbs! 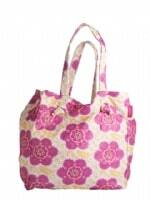 I received my very own Suzani Saky Sack in Pink to try out and see how I liked it. First off, this is one cute bag! Pink is my favourite colour so it’s very “me”. Â It came to me all compact and folded up and I was surprised to see what a good size it was when it was fully opened up. It looks so small when its folded up and its really deceiving when you first see it. This is one of my favourite features of the Saky Sack. I like that it does easily fit into my purse so I can bring it everywhere. I mean what is the point of a reusable shopping bag if you can’t bring it with you everywhere? The material is also very different and is unlike other reusable bags. Its hard to describe the texture…maybe a cross between a canvas and plastic. It does hold quite a bit and is a strong bag. I put groceries in mine and it holds up well. 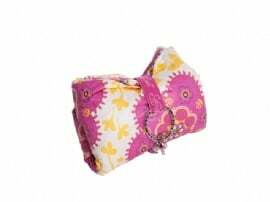 Â I like that it is easy to fold up when you are finished using it and is held together by the key ring clasp and the elastic band that is built right into your bag. Its also machine washable, but hang it to dry. Don’t put it in the dryer. 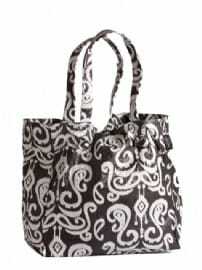 The Saky Sack comes in other styles like the Saky Ikat in Black and the Spotty Saky. I like all of them and could easily picture myself using them. It’s nice to shop in style with the Saky Sack. They are priced at $24.95. Check them out and see which Saky Sack suits you. Thank you for a great review, so glad to know you like Saky Sacks!